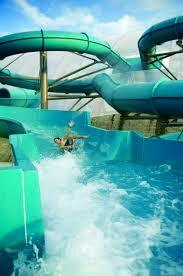 There are many waterparks within the Chicagoland area and within driving distance. A waterpark has water geysers, slides and the like. Many municipalities also convert many of their swimming pools and more into temporary waterparks on certain days or special occasions. During the simmer days of summer, waterparks and pools are the place to be. Many of them are also indoor, and can be visited year round! Many other waterparks are within driving distance from the metropolitan Chicago area. Indoor -- lap pool, dive pool, family activity pool with floor geysers, tot slide, bubble bench, 5o-ft long slide, zero-depth area, unisex sauna. Indoor -- 6-lane 25-yd lap pool, zero-depth leisure pool, water slide, water spray, children gator slide, adult whirlpool. Indoor -- 25-yd lap pool, water playground and water toys during open swim. Outdoor -- Rainbow Falls Waterpark, a tropical paradise packed with fun and adventure. Indoor -- Pavillion Aquatic Center, South Sea Lagoon Pool with a 72-foot waterslide, grassy huts and palm trees; 25-yard Indoor Pool; 25-yard Outdoor Pool, Splash Pool and sunbathing patio. Outdoor -- zero-depth pool, 25-yd lap pool, water slides, drop slides, diving area, wet sand play area, water playground, sand volleyball, tanning area. Indoor -- three water slides, rapid water channel, water playground, diving pool, lap pool, beachlike entry pool, whirlpool, nursery. Indoor -- zero-depth, walk-in entry leisure pool, interactive spray fountains, water slide, "Lazy River" Vortex, 25-yard lap pool, men & women's saunas, adult whirlpool. Outdoor -- Aquatic Center: tube and body slides, drop slides, toddler slide, lap lanes, sand voleyball, tanning area, cafe, picnic area, diving board, zero-depth pool, sandplay, tsunami splash, splash pool. Indoor -- Aquatic Splash: zero-depth pool, 4-lane 25 yd. lap pool, toddler slide, interactive water plays, lazy river, observation area.